Corporate compliance has become very complex and is continually evolving; it seems to have almost a life of its own. Compliance Manager helps reign in this dynamic enigmatic entity by providing a unified, centralized, comprehensive, and plethoric source of information. This, in turn, provides leverage for meeting desired corporate compliance in accordance with Microsoft recommendations and industry standards. So what is it really? 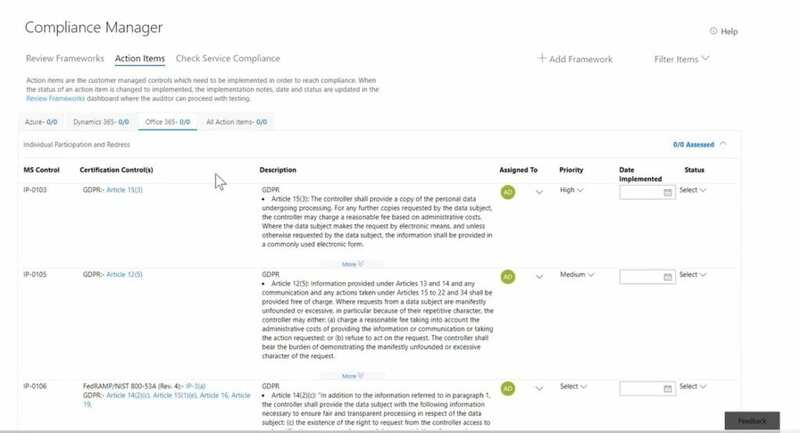 Compliance Manager is a dashboard that provides a summary of your data protection and compliance status along with recommendations to improve them. You should note that this is only a recommendation; it is up to you to evaluate its effectiveness in your regulatory environment prior to implementation. Recommendations from Compliance Manager should not be interpreted as an ironclad guarantee of compliance. The core component of Compliance Manager is an Assessment. This Assessment combines a Microsoft cloud service (such as Office 365, Azure, or Microsoft Dynamics) with a certification standard or data protection regulation (such as ISO 27001:2013 and GDPR). Assessments help you to discern your organization’s data protection and compliance posture against the selected industry standard for the selected Microsoft cloud service. You can obtain rich insights into Microsoft’s and your responsibility to meet compliance standards. 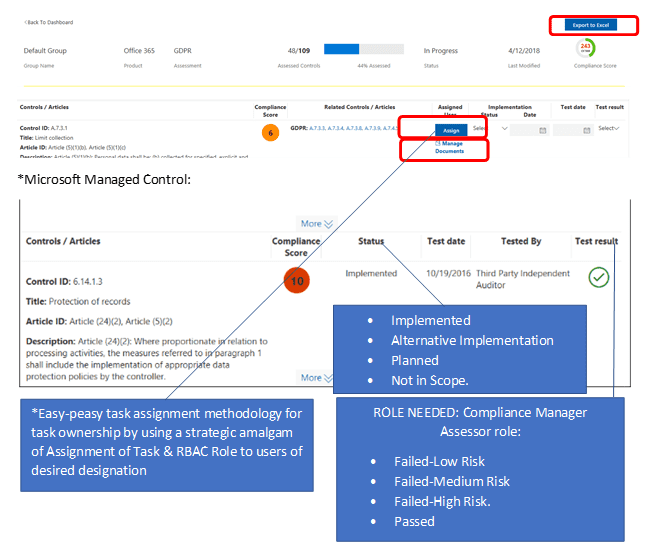 For each Microsoft-managed control, you can see the control implementation and testing details, test date, and results. For the controls you manage, you will receive recommended actions with step-by-step guidance for implementation and testing. 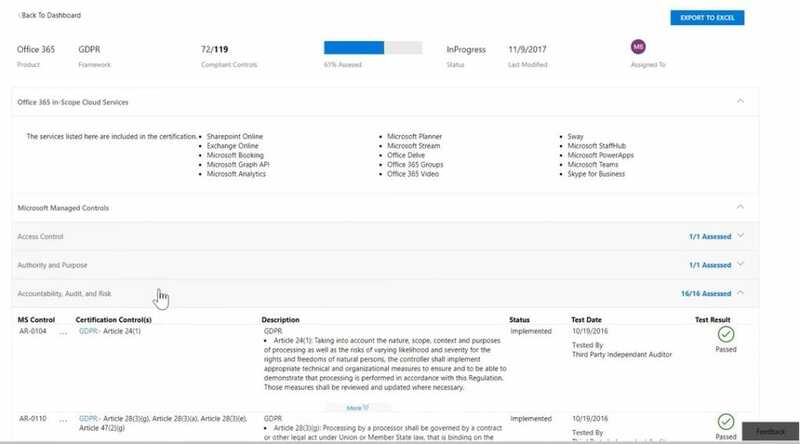 This tool will help you better understand how to use the Microsoft cloud features to efficiently implement the controls managed by you. Compliance Manager helps you to simplify your compliance process by providing a control management tool for you to assign tasks and collaborate across teams more efficiently. You can generate audit-ready reports with evidence in a few clicks, reducing the need to manually collect information across multiple teams. This tool will help compliance / security / privacy officers, and risk assessors to perform proactive pre-assessment and get ready for the audits. Go to https://aka.ms/STP, which resolves to https://servicetrust.microsoft.com. Sign in with your Office 365 or Azure Active Directory (Azure AD) user account. The Compliance Management dashboard has an associated Compliance Score for each default grouping standard. This helps both track environment compliance progress and prioritize the auditing controls that will reduce your organization’s exposure to risk. It also can be customized to add standard framework groups (like GDPR). In the Service Trust Portal, click Settings → Select Role drop-down list, click the role that you want to add users to → Click +Add, add a user to the role, and then click Save. 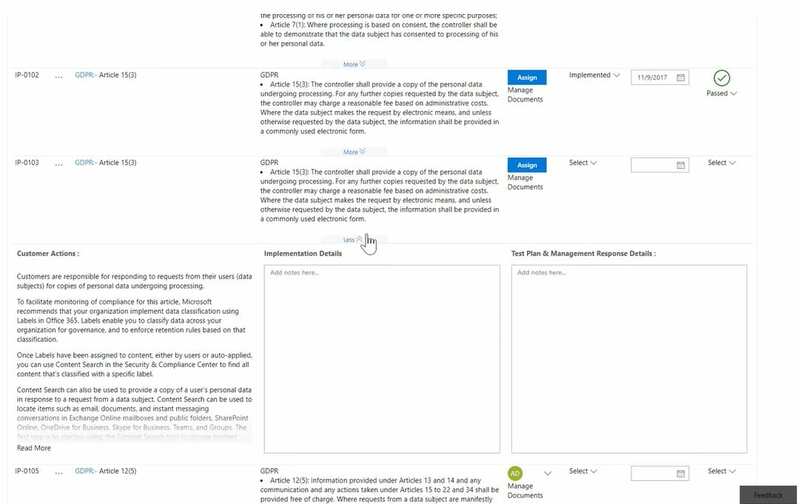 Compliance Manager also provides a secure documentation repository where you can upload and manage evidence and other artifacts related to your compliance activities. It also provides richly detailed reports in Microsoft Excel that document the compliance activities performed by Microsoft and your organization. These can then be provided to auditors, regulators, and other compliance stakeholders.